Photo: White Mansion, ca. 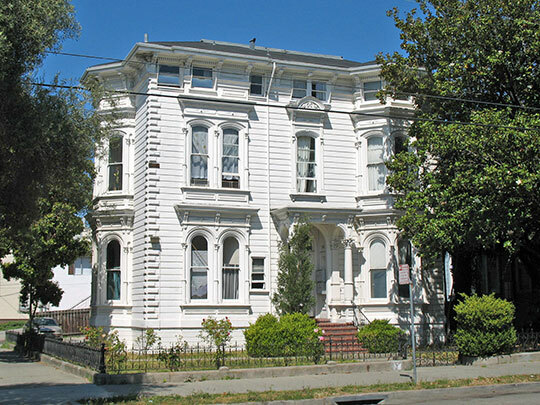 1878, 604 E. 17th St., Oakland, CA. Listed on the National Register of Historic Places in 1980. Photographed by User:Sanfranman59 (own work), 2009, cc-by-2.5 (creativecommons.org/licenses/by/2.5)], via Wikimedia Commons, accessed August, 2013. The Alameda County Courthouse and County Administrative Offices are located at 1221 Oak Street, Oakland CA 94612; phone: 510-208-9700. In the year 1853 Alameda was created as a separate county. The derivation of its name is simple and easily given. It comes from the Alameda Creek, its principal stream, which runs through its most southerly township, east and west, and had been the dividing line between Santa Clara and Contra Costa before separation. It rises in the mountains of the Contra Costa range, emerges thence at Niles, and winds through the plains until it enters San Francisco Bay near Alvarado. The word alameda is Spanish for a shaded road, walk or avenue. Those who had the largest share in shaping affairs in the new county, at the start, were Henry C. Smith, Judge A. M. Crane, A. M. Church and Horace W. Carpentier. The southerly end possessed the controlling influence, as it carried off the county seat and nearly, if not all, the offices. William Halley, The Centennial Year Book of Alameda County, California, William Halley, publisher, Oakland, CA, 1876.